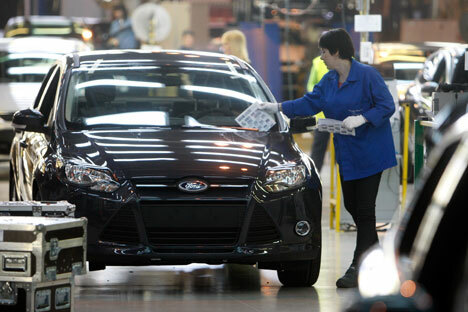 Car manufacturers such as Ford, Renault and Fiat, have rolled back their production in Russia, as the 10 percent depreciation of the rouble against the dollar has led to higher costs for foreign parts. According to Mikhail Zadornov, president and director of the VTB24 bank, during the first two weeks in March 2014, bank depositors withdrew 13 billion roubles ($360 million) from their accounts. Investors are acting this way for two reasons: first, the events taking place in Ukraine, and secondly, the sharp depreciation of the national currency. Since the beginning of the year, the rouble has fallen by more than 10 percent against the dollar. According to Savinov, a weakened rouble made ​​imports more expensive, leading to its decrease in the per annum comparison. In particular, relative prices for components for factories, machinery, and equipment, all which allow factories to increase productivity, rose. The main reasons were said to be the depreciation of the rouble, the slowing of consumer activity in the market and the fall in demand for cars. In response, France’s Renault LCV and Italy’s Fiat may back out of an agreement to assemble commercial vehicles at the MosavtoZiLa plant in Moscow. Negotiations with Renault have been suspended, and with Fiat they are still on the table, but the Italian side is not demonstrating great enthusiasm. According to the official statement from Renault, its decision was primarily due to the depreciation of the rouble against the euro, which made the issuing of a contract between Renault LCV and ZiLe unprofitable. The depreciation of the rouble is, first and foremost, creating subsidies for domestic producers. However, as Vasily Yakimkin, associate professor at the School of Finance and Banking of the Russian Academy of National Economy and Public Administration claims, those who benefit in the era of globalization have a large share in the creation of additional production for Russian companies. “If the components are supplied by foreign partners, the depreciation of the rouble increases the cost of production. In Russia, imported materials and components products are widely used in production.”Given that Russian plants are buying the latest technology, as a rule, usually in Western currency, the depreciation of the rouble also makes it difficult for them to upgrade their machinery, equipment, etc. However, despite this, the depreciation of the rouble has already helped domestic industry, according to the Federal State Statistics Service. In March, Russian industry grew by 1.4 percent, and for the quarter, by 1.1 percent.